CMS officials want navigators and other assisters keep working after QHP open enrollment ends. 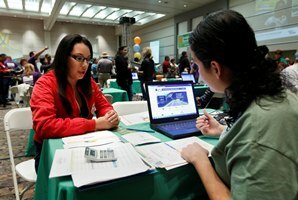 The Centers for Medicare & Medicaid Services is hoping the army of 30,000 exchange enrollment workers it has created will stick around after the end of the open enrollment period. CMS officials discussed the future of navigators, certified application counselors and other exchange helpers in an e-mail newsletter the agency sent to in-person assisters last week. The ordinary open enrollment period for individual exchange coverage started Oct. 1 and is set to end March 31 in most of the country. But that doesn’t mean public exchange helpers will be done with their duties April 1. “In-person assisters, including navigators and certified application counselors, will continue many of their existing functions,” officials wrote in the weekly newsletter. The assisters will help consumers sign up for coverage, answer questions about using the new coverage, and educate them both about the Patient Protection and Affordable Care Act and about health insurance, officials wrote. Officials also said assisters may also help consumers appeal exchange or plan enrollment decisions, or decisions by plans to deny claims. CMS does not send the in-person assister newsletters to agents and brokers. Health Agents for America, an agent group, obtained a copy of the newsletter from an unnamed recipient and forwarded it in an e-mail of its own to the agents on its e-mail list. PPACA requires the state-based exchanges and the federal exchanges run by CMS to offer consumers access to “navigators,” or ombudsman services that would be free from health insurance company financial influence. CMS later created certified application counselors and other types of “assisters,” to provide exchange helpers who could operate with somewhat different regulatory requirements and funding sources. Certified application counselors, for example, can be clinics or hospitals that get money from health insurance companies. The open enrollment system applies only to consumers buying individual qualified health plan coverage through an exchange. Consumers can get a QHP “special enrollment period” after March 31 by showing that they have undergone a major life change, such as the loss of a job, or that they qualify for a hardship exemption from the usual open enrollment period rules.